With 6 people in our household, we go through a “lot” of hand soap. I won’t have anything but antibacterial soap in my home. 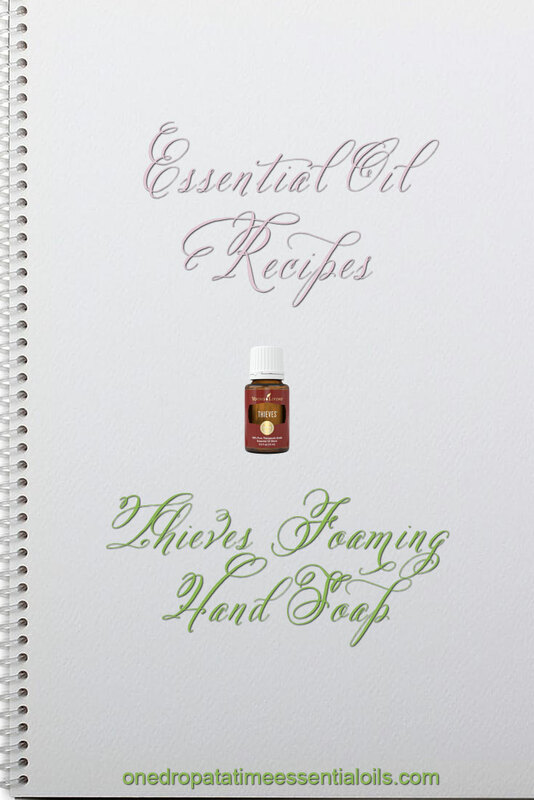 Thieves Essential Oil Hand Soap is the simplest recipe you will ever make. Be sure to read about the history of Thieves Essential Oil here and how it was inspired by the 15th century legend! Thieves is a blend of clove, lemon, cinnamon, eucalyptus radiate, and rosemary essential oils. It smells like Christmas and kills 99.96% of bacteria germs naturally without any harsh chemicals. The ingredients of an 8 ounce bottle of this foaming hand soap costs a little over $1.00 to make and it’s free of any unnecessary chemicals. The great thing about this recipe is you can reuse the pump bottle over and over again. In my house there can’t be enough Thieves anything. I have the Thieves Household Cleaner mixed up in a spray bottle to clean every surface I can find to rid it of nasty germs so I thought, why not have a foaming hand soap made with Thieves. What better way to rid the germs your hands come in contact with. Fill container with filtered water and shake to mix well.